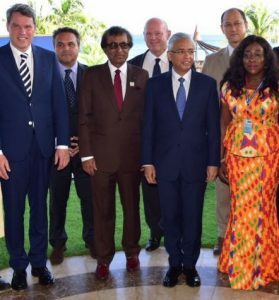 Port Louis (Mauritius) – May 25, 2018 (travelindex.com) – Tourism Ministers and dignitaries from right around the world joined some 400 Mauritius Tourism professionals at a conference that touches at the core of tourism today and tomorrow. The conference that coincided with the 50th Anniversary of Independence of Mauritius from the United Kingdom took place at the Le Meridien Hotel was officially launched by Hon Pravind Jugnauth, the island’s Prime Minister in the presence of President Didier Robert of Reunion, Hon Catherine Abelema Afeku, Minister of Tourism of Ghana, Hon Adil Hamid Daglo Mussa of the Republic of Sudan, Richard Via of Madagascar, Pamela O. Sooprayen-Kwet On of Rodrigues, Fekitamoeloa Utoikamanu, the United Nations Under Secretary General and High Representative of the Least Developed Countries, Dr Dirk Glaesser of the UNWTO, Alain St.Ange, head of the Saint Ange Consultancy and former Minister of Tourism, Civil Aviation, Ports and Marine of the Seychelles, Pascal Viroleau, CEO of the Vanilla Islands to name but a few. Hon Anil Gayan, Minister of tourism of Mauritius said when he addressed the conference that:- ” Tourism in Mauritius relies of security of the destination, high quality resorts, a multi-ethnic population, a confluence of religion, cultures and traditions, in fact a mosaic of the world. Tourism is always a work in progress and this is why we are here to learn and to strategize. The choice of the theme is deliberate as we all know that travel and tourism of tomorrow will be determined by the impact of Digitalisation on Sustainable Tourism. Travelling into the future conjures up an image of Mauritius as a Digital Paradise. We intend to seize the potential of new technology to advance the tourism industry. With social media and new products like crypto-currency and blockchain, technology will shape the world of the future. How we respond to the new paradigm will determine the fate of the industry. Sustainable digitalization and digitalized sustainability – that is the question. As travel is about connecting people and places, there is always a great story to tell afterwards. Travel opens mind, fosters mutual understanding and, as a contributor to world peace, tourism is people to people diplomacy at its best”. The Indian Ocean Vanilla Islands and the African mainland were well represented at this important tourism meeting that saw many panel discussions from experts and strategists.